Much of the discussion about Canada’s Northern economy focuses on the state of the extractive resource industry, or more generally, on what is needed to improve regional economic development. Trade, which is connected to both resources and development, is often omitted from these discussions. This article seeks to bring trade to the fore by providing a brief overview of Canada’s current free trade agreements with its Arctic partners. Next, it provides recent statistics for Canada’s three territories (Yukon, Northwest Territories, Nunavut) in relation to merchandise trade with the US, Alaska, and the other Arctic states. Finally, it raises some challenges and opportunities to further the conversation on Arctic trade. Before looking at Canada’s trade agreements, it is necessary to understand the division of powers between the different levels of government. Section 91 of the Constitution sets the responsibilities of both the federal and provincial governments, whereby trade is a federal responsibility (Constitution Acts, 1867-1982). This means that the provinces and territories are unable to negotiate their own international trade agreements. That being said, provinces and territories are becoming increasingly more involved in the process through consultations with the federal government during trade negotiations (Gauthier & Lapointe, 2011). Nevertheless, any trade agreement that will be of benefit to the North must be negotiated through Ottawa. Anyone paying attention to Canadian politics will know that the North American Free Trade Agreement (NAFTA) is currently being renegotiated for the first time since its implementation in 1994. 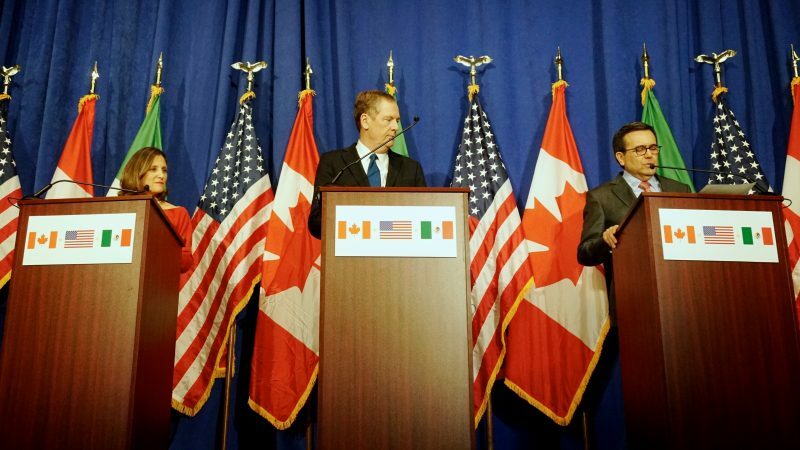 The Agreement seeks to stimulate economic growth by facilitating trade of goods and services between Canada, the United States (US) and Mexico in a number of sectors (Global Affairs Canada, 14 February 2017; 30 November 2016). The trade needs of Northern Canada have been heard during negotiations in three different venues. First, the Premiers of Yukon and the Northwest Territories (NWT), along with other provincial Premiers, have advocated for the importance of NAFTA to both countries during a pre-negotiation visit to the US (Council of the Federation, 8 June 2017). Second, the federal government is “fully engaging provinces and territories in the negotiation process to ensure their interests are well represented” (Council of the Federation, 7 December 2017). Finally, the federal government held a number of public consultations across the country, including one in Whitehorse, Yukon’s capital (Global Affairs Canada, 14 December 2017). NAFTA, however, is not the only source of free trade for Northern Canada. Canada has already engaged with six of the seven other Arctic states in different free trade agreements (see Table 1). For example, the Canada-European Free Trade Agreement (EFTA) was implemented on 1 July 2009, and seeks to remove tariffs on traded goods (Global Affairs Canada, 5 May 2017). More recently, the Canada-European Union: Comprehensive Economic and Trade Agreement (CETA) came into effect on 1 September 2017, and it addresses “goods and services, non-tariff barriers, investment, government procurement, as well as other areas like labour and environment” (Global Affairs Canada, 25 October 2017). Source: Global Affairs Canada, 17 November 2017. The only Arctic country that Canada currently does not have a free trade agreement with is Russia. The ongoing financial sanctions against Russia and the extended agricultural sanctions against Canada and other Arctic states (to name a few) make it unlikely that an agreement will be made in the near future. Canada and its Arctic partners are also signatories to a number of World Trade Organization agreements (Global Affairs Canada, 17 November 2017) that set the ground rules of international trade, free or otherwise (WTO, n.d.a. ; n.d.b.). This is important as trade between the Arctic states can, and does, take place outside of free trade agreements. There are number of opportunities for Canada to engage with its Arctic partners in various types of trade activity. Yet, there is little public discussion about trade and Canada’s North, let alone an understanding of the value of trade within the context of a free trade agreement or not. There are strong trade linkages between Canada and the US. Table 2 shows that at the national level, a significant amount of goods are traded back and forth between the two countries. At the territorial level, Yukon, maintains the strongest trade relationship with the US, Alaska in particular. This is likely due to the territory’s proximity to the US/Alaskan border and the port in Skagway, AK. The Northwest Territories (NWT) has the second largest trade economy with the US/Alaska, although it is significantly smaller and only consists of exports. Nunavut has the smallest trade relationship with the US and did not have any trade exchanges with Alaska in 2016. Territorial trade at the pan-Arctic level tells a similar story. Indeed, Canada has ongoing trade relations with the other Arctic states, regardless of when the free trade agreements (or lack thereof) came into effect. Table 3 breaks down the volume of merchandise trade for 2016 by country and territory. At the national level, Canada conducts a fair amount of trade with most of its Arctic partners, even if it is a relatively small portion of Canada’s total trade with the world. However, when the data is regressed to the territorial level, a different story emerges. Not all of the Canadian territories trade with the other Arctic states, and similar to trade with the US, the volume of trade is relatively small. Table 4 turns the volume of trade in millions into a percentage for easier comparison. For example, Yukon’s exports to the US account for almost 97% of the territory’s export trade with the world, whereas its exports to Sweden and Finland combined account for less than 1%. Data source: Statistics Canada, 16 February 2018. As the trade statistics are for year end 2016, it will be interesting to see the numbers for year end 2018 to see if a full year of trade under CETA increases trade volumes with Greenland, Sweden, and Finland. While the volumes of international trade by the territories seem relatively small, they are no doubt important for the territorial economies. This raises questions about what could be done to increase their value. As the Northern economy is largely reliant on resource extraction, changes in the market can have consequences for regional trade beyond anyone’s, or any politician’s, control. That being said, there are some things that can be done to help the territories grow their international trade, be it with the US or other Arctic states. First, transportation infrastructure needs significant and immediate investments. Road, air and maritime infrastructure are lacking in general, and are also not uniform across the region. For example, Yukon has a more developed road network than the other territories. Estimates suggest it could be upwards of 20 plus years before new transportation networks are completed (Transport Canada, 2015a). This puts Canada and the territories at competitive disadvantage, especially as “other Arctic countries have more mature transportation infrastructure to support development” (Transport Canada, 2015b, p. 66). Second, and more importantly, there needs to be a solid regional economic development plan (Exner-Pirot, 30 January 2018). While economic development is more than just trade, they help fuel each other. The territories are gaining more control over their economies as they gain more powers from the federal government through the process of devolution (Government of Canada, 13 April 2015). Yukon and the NWT have already signed their agreements and Nunavut’s devolution is in progress (Government of Nunavut, n.d; INAC, 23 January 2014; 4 June 2013). This is important as those who live in the North know best what they need. When it comes to trade, all levels of government, including Indigenous governments, need to be actively involved in negotiations beyond just participating in consultations. Finally, within the past year, the idea of a pan-Arctic free trade arrangement has been championed by the current Chair of the Arctic Economic Council, Tero Vauraste. Although there would be challenges to this kind of agreement, Mr Vauraste recognises the opportunities that regional trade can provide, such as contributions to development projects (Quinn, 11 May 2017; Staalesen, 22 November 2017). The possibility of a regional Arctic free trade agreement sounds like an intriguing idea, but there would be much to consider for Canada. For instance, would it only be applicable to the three territories? If not, how would it be different from CETA and EFTA? If so, could an exception be made that would allow territorial leaders to take point on negotiations to ensure their interests are truly represented rather than those of Ottawa? Even if the possibility of an Arctic free trade agreement is still years away, politicians need to begin thinking about it now. This is only the beginning of the discussion around Northern trade. This article looked only at trade with other Arctic states, and regional trade volumes and patterns may differ with other markets. Moreover, the territories trade significantly more with other Canadian provinces than they do internationally (NWT Bureau of Statistics, n.d.). Both of these should be explored as there may be similar opportunities and challenges to accessing these markets, that if addressed, could improve the North’s economic development. Karen Everett is a Fellow at Polar Research and Policy Initiative and is based in Peterborough, Ontario (Canada). She is also a PhD candidate at the Frost Centre for Canadian Studies and Indigenous Studies at Trent University and holds a Master’s degree from Ryerson University. Her research examines security in the Canadian North, including emerging regional border management issues. Additionally, she explores how securitisation theory and the principles of multi-level governance can contribute to the policy making process. Karen has presented her research at national and international conferences.